Sharing code which retrieves related record’s field data value (Connections) and parse the data based on relationship metadata type property. Let’s say, we want to add a custom button in Activity group of Contact and on click it will open a window to create CustomerVisits (new_customervisit) record which is a custom activity. Follow the below steps to create a button in existing group. Step #1 Create a new solution say TestSolution. Step #2 Open newly created TestSolution and the entity on which you want to button.I have added contact entity. Step #4 Export the TestSolution for editing. Step #5 Open customization.xml file from exported solution for editing. Step #6 Find out RibbonDiffXml tag and replace the code from <RibbonDiffXml> to </RibbonDiffXml>With below code. Step #7 Save the customization.xml file. Step #9 Remove the contact entity from TestSolution. Step #10 Delete the solution TestSolution. 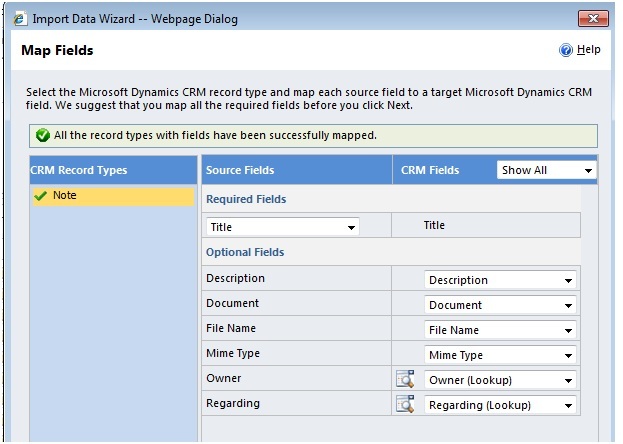 Author Arvind SinghPosted on September 10, 2010 September 10, 2010 Categories CRM 2011, Microsoft Dynamics CRMTags CRM 2011, CRM 5, CRM5, New Feature in CRM 2011, What's new in Microsoft Dynamics CRM 20112 Comments on What’s new in Microsoft Dynamics CRM 2011?